Jewel is not involved in either recording, but both songs were recorded during Jewel-related events and both are by songwriters that directly encouraged and inspired Jewel during her formative years on the San Diego coffeehouse circuit. The two artists in question are Gregory Page and Steve Poltz, two prolific artists who, at the time Jewel first landed in San Diego, were working together in The Rugburns. By the time I made these 1997 recordings, Gregory and Steve were each pursuing individual paths, although those paths still occasionally cross from time to time. The first song, “Tomorrow Is Found,” is a live recording I made of Gregory performing solo acoustic at Java Joe’s, when he concluded the first night of the Pajama Jam, a private EDA Foundation event that occurred on November 28th and 29th, 1997. 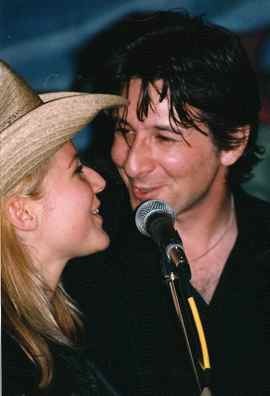 Here's a photo of Gregory and Jewel singing together, shot earlier that very same night. Until now, the only issued recording of “Tomorrow Is Found” was on an extremely difficult to find 91X local artists compilation, briefly available to listeners in the early 90’s. This incredible song is not available on any of Gregory’s albums. There were a lot of outstanding performances during the two night event at Java Joe's and this song is definitely one of them. Its also one of the saddest, most touching Christmas songs I’ve ever heard. In early 1998, the 3rd volume of a free cassette series called “Future Folklore” contained highlights from this event and my only regret about it was that we didn’t include this song. I think my reasoning at the time was that the levels were a little too hot, but in retrospect I wish we included it back then. Nobody can evoke melancholia quite like Gregory Page and this song is a prime example. I recorded this hilarious number during Jewel’s 1997 Tiny Lights Tour, when the trio incarnation of The Rugburns opened for Jewel and served as her band. This wasn’t from any of the concerts though, but rather from a soundcheck at New Haven’s Palace Theater on the afternoon of February 23, 1997, prior to Jewel’s arrival. 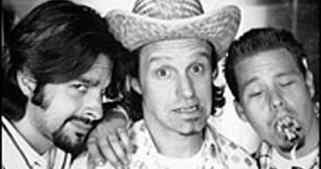 The configuration of The Rugburns heard on this recording features John Castro on bass and vocals, Steve Poltz on guitar and vocals, and Jeff "Stinky" Aafedt on snare drum and brushes, seen together so flatteringly here. When I recorded this, there was no audience present, so it sounds like a studio demo, but its actually an impromptu live performance for their own amusement - and now yours, too... I think you'll enjoy these unreleased recordings. Both are prolific songwriters with wide ranging material, which I know is a primary reason many of you appreciate Jewel. There's a lot to admire about each of them and I strongly encourage you to check them both out. If you are already a registered member of jeweljk.com, simply log in to the community area and help yourself to both song files here. If you are not yet registered, please register first here. Its free and easy. If you experience any technical difficulty, don't hesitate to ask for help at help@jeweljk.com. If you’ve missed any of our previous Club EDA downloads, all of which are unreleased recordings of Jewel, they are all still available, so you can help yourself to those files as well. For details on the previous downloads, simply access my previous blogs about each of them by clicking “Alan." Big thanks to Gregory and Steve for allowing us to freely share these archive recordings with you. So... without further ado, here is Gregory Page performing “Tomorrow Is Found” at The EDAFoundation Pajama Jam at Java Joe's on November 28, 1997 and The Rugburns running through “I Hate Christmas” on the afternoon of February 23, 1997.